Ask fellow campers about "Scotia Pine Campground" and nearby attractions. Very clean campground, large sites with grass. . Anyone who visits here should make the effort to visit the park. People at check in very helpful and pleasant. Will come here again. We camped at Scotia Pine Campground in a Travel Trailer. Visit Victoria park, shop in the town of Truro.Go to Masstown Market and you can also see the tidal bore and very nice drive to 5 islands to get fresh clams for a clam bake back at your campground. I agree with most everything that has been stated. We stayed there 6 nights. It was our base for touring Halifax and Peggy's Cove. It worked out well for that. We arrived on a Friday night, and it turned out to be the worst camping night of our entire 14 years of camping. BEWARE that quiet hours don't start until MIDNIGHT. Then "quiet conversation over the campfire is encouraged." We had neighbors 3 sites away that were still going strong at 2:30 AM. The owner was VERY responsive to our 12:30 AM email complaint. The next night was better, but not as it should be. These campers played outdoor music during most of the day that reached well beyond their site. The campground is a weekend destination I think for locals. When the weekend ended, it was SWEET and quiet. Sites are very close. A picnic table and a pine tree trunk separate the sites. It's nice the seasonal campers are separate from the transients. We'd stay again if it suited our plans. We camped at Scotia Pine Campground in a Fifth Wheel. Either electric or sewer extension might be needed. We were parked under the pine trees and they afforded us some great shade. We were facing a large open field where we walked the pups. The CG is very large. We were separated from the seasonals as they were together off to the sides. Showers are older but clean. They take quarters. We camped at Scotia Pine Campground in a Motorhome. My wife & I stayed here twice in our 35 ft 5th wheel during our current Nova Scotia trip. $45 CAD/night. We stayed 5 nights in early July, just as we were getting to Nova Scotia and then 2 nights 3 weeks later in July as we were transiting to southern Nova Scotia. We like this place. During our 1st stay we celebrated Canada Day with our Canadian hosts/neighbors & it was a lot of fun. Good local music one night @ the Campground plus fireworks! Nice laundromat. The transient pull thru sites under the pines are very close together, but OK, grass & flat. Good wifi. No cable. We were able to get one local TV station on our antenna, my wife appreciated that. No luck with our US Dish satellite TV. We would definitely come back here again. Nice folks in the onsite office. 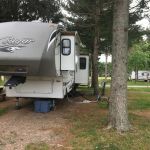 We camped at Scotia Pine Campground in a Fifth Wheel. Frank & Geno's Italian restaurant was great! Also nice to have a Walmart store nearby to stock up. This is a big park with lots of seasonal campers & many families. We were there on a Saturday night & they had a band & fireworks so it's hard to determine if this is a typical weekend night. Sewer & water are in the very rear of the sites so bring extra water & sewer hose. We would come back again. Most of the roads are difficult to maneuver although our site was easy to access. We camped at Scotia Pine Campground in a Fifth Wheel. Transient sites in both treed or open area. As we were staying during the last week the park was open for the season, we had the place to ourselves. Parked under the section covered in pine trees has its good and bad, unfortunately the pine cones were dropping along with the needles during our stay. The plus is they would provide protective shade in the hot summer months. There are a number of sites for tent camping which are set in the back area of the park, these sites appear to be very generous and private. The park appears to be well kept, staff was busy packing up picnic tables and cleaning up the park for the winter everyday while we were there. The sites are near one another, but with enough space to have awning and outside chairs easily set up. Driving in and out of the park is easily handled without concern for overhead trees as they keep them well trimmed. Hook ups were nearby and worked without incident. WiFi worked well, but given the lack of others in the park that may be our luck. We would stay here again. We camped at Scotia Pine Campground in a Motorhome. We stopped for the night en route to another destination and inquired about the laundry and the lady at the desk was able to give us a pull through directly across from it which was very handy. About 1/3 of the campground are permanent residents and are in one area to one side. The remainder of the campground is set up for short term guests. Most of the sites are pull throughs in a lightly forested area. I didn't notice any particular road noise although the campground is fairly close to the highway. I would come back if in the area. We camped at Scotia Pine Campground in a Travel Trailer. The pull through sites were big, and utilities were good. Antenna reception was pretty good. Nice big pine trees for shade. The staff were great. I did do laundry, but the washers were old and didn't spin the clothes very well. The staff reimbursed me so I could use a different washer to redo the load. One washer said cold water only, but if you don't put the lid down until you are ready to start the load, you don't see it. Dryers worked well. We camped at Scotia Pine Campground in a Fifth Wheel. Staff was very friendly...site was level and mostly grass with shade...site are somewhat close but ok....had no problems getting mh in site...all services worked well...ATT cell signal was ok, used our hotspots for wifi...got a lot of channels with antenna....did not use showers or restrooms since this was a stop over to Cheticamp.....park was clean, would say here again if in the area..... We camped at Scotia Pine Campground in a Motorhome. Our site was perfect, situated under the pines. Owner was very knowledgeable of the area and very friendly. Laundromat was clean and very inexpensive! Just a few minutes from downtown Truro. We camped at Scotia Pine Campground in a Travel Trailer. Visit Victoria Gardens and for downtown Truro for shopping. I recommend Sea Shell Designs and Beck and Boosh if you love one of a kind jewelry. And the Engine Room for a delicious and inexpensive lunch. Stayed twice while touring NS. Wi Fi did not work either time! Spaces are close but sufficient. 30 amp very weak. Park very clean. We camped at Scotia Pine Campground in a Motorhome. Take the Segway tour at Victoria Park. Rate is for an unserviced site. We needed a to stay for only two nights to see the Tidal Bore and this park is perfectly located. Since the full hookup sites seemed to us to be crowded, dark (heavily treed), and expensive, we chose an unserviced site and loved it. These spacious, reasonably level grass sites are on the edge of the park across from seasonal units, so there is very little park traffic (although the highway noise is quite noticeable). The entire park is very clean and well-maintained, the seasonal units are well-kept and the staff is very friendly and helpful. We camped at Scotia Pine Campground in a Motorhome. Thanks to one of the Scotia Pines staff, we had a great view of the Tidal Bore from the Hwy 236 bridge next to the Fundy Tidal Interpretive Center. Better yet, if you go to the Center 90 minutes before the tide, they'll direct you to spots in South Maitland where you can see the tide go through, then you drive back to the Center to see it again. We were greeted by an exceptionally friendly person at the front desk. The park was easy to access off the 102 but you can hear the highway noise. The sites were very pretty with trees but crowded. Sites were level with gravel. Wifi was free and good at our site. The laundry facilities were good and not too expensive. Overall, the campground was very tidy and clean. However, although the campground was pleasant we felt it was expensive for what was offered. We camped at Scotia Pine Campground in a Travel Trailer. The tidal bore in Truro is definitely worth a visit. Victoria Park had some lovely trails. Truro has all the facilities you could need. 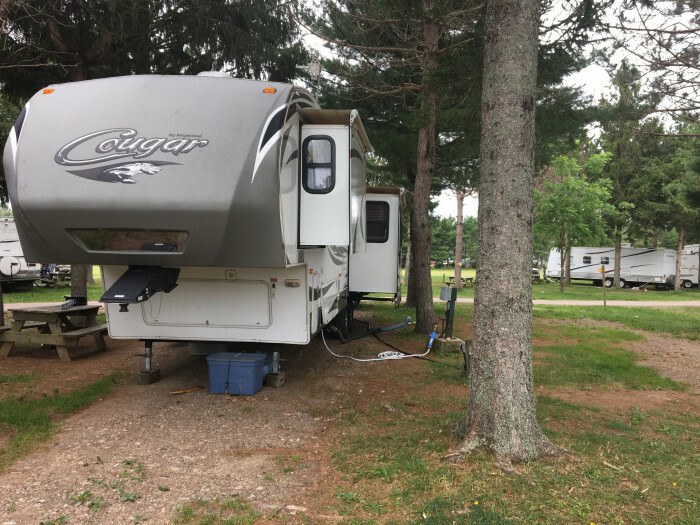 This is a well maintained family oriented campground, with helpful and friendly staff at check in. Interior road is gravel. Our grass site was a level and long pull through with space to park our towed, big rig access was marginal. Fairly quiet with shade trees and a picnic table, there are a lot of seasonal sites but all were neat and tidy. There is a small pool. The bathrooms were dated but clean, however the laundry needed a good clean. A small security gate was used after 10pm. Pet friendly but we did not see any doggie bags or disposal stations. WiFi was only available at sites near the office and satellite was a challenge but cell was good. There was the occasional noise from a train, but it did not worry us. We would stay here again. We camped at Scotia Pine Campground in a Motorhome. Food stores and restaurants are in Truro, which is about 6 miles from the campground. We came to the area for access to the Bay of Fundy and the Tides. Easy access from Canadian Express road. Close to town but in the country. Lots of long term but transient area is in the pines, hence the name. Spent three nights in pull-through site. Staff helpful with directions and suggestions for the area. Tidal fluctuations were amazing. We camped at Scotia Pine Campground in a Fifth Wheel. Are you affiliated with Scotia Pine Campground ?